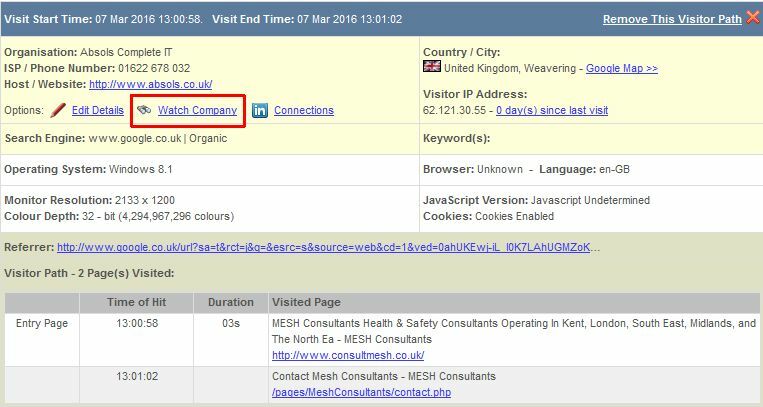 Although you can generate and automatically receive daily visiting companies reports, there are times when it’s useful to get an instant email alert when a company has returned to your website. Companies that you consider to be prospects, who you should ideally be contacting quite quickly after they’ve been to your website (instead of waiting for your next daily report). If a prospect gets a phone call or email from you 30 minutes or an hour after they’ve been back to your website, then you’re likely to be more ‘top of mind’ with them and so you’ll probably get a better response than leaving it later. Existing clients that visit your website may be thinking about utilising more of your services, or may even have a problem. If they don’t contact you, and you proactively contact them, you have the opportunity to strengthen the relationship. In both cases, you will receive an email alert, providing you with a link that takes you through to the detail of what that visitor looked at on your website very recently. This helps you to formulate your communication with them.Generally, you wouldn’t pick up the phone/email, telling them that you know they’ve been on your website. Instead you’d create another reason for contacting them (perhaps a courtesy call) and quite often they’ll say something to the effect of “that’s really strange – I was on your website earlier”, to which you could respond “ah, that’s good timing then”, instead of responding “yes, we’ve been tracking your every movement”! In either case simply click on ‘Watch Company’, which will change the link to show as ‘Stop Watch’. 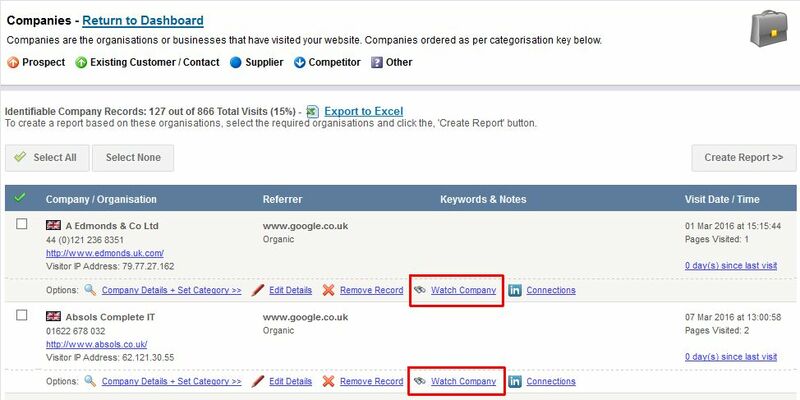 By clicking on the link you will be taken to the details of that company and what they looked at while on your website. Currently, the ‘Watch Company’ only emails to the A1WebStats account owner, although this will be changing (in the next version of the system) to allow the ability to email watch alerts to a range of different people. 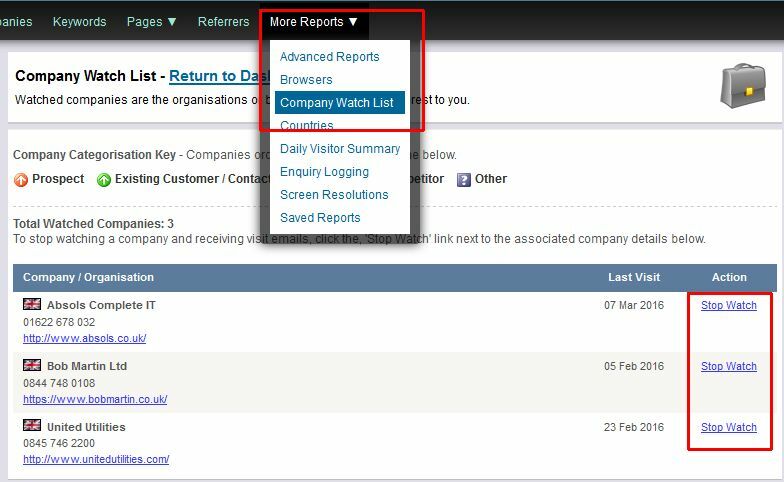 If you want to stop watching any companies you can do so by either clicking on ‘Stop Watch’ from the Companies view, or you can select your Company Watch List from the More Reports menu, as shown here.